The channel selection menu comes up again. If more than one waveform file available for the event, one or several others can be selected. Input is from filenr.lis: The current file is deleted and if in default mode, the plot moves on to the next event. MULPLT is started from EEV: If only one waveform file is available, the program proceeds as under (1). The waveform file is deleted and the waveform file entry in the S-file remains. However, if more than one waveform file is available, the user can use a menu to select which files to delete. Only the waveform file entries in the S-file are deleted, the waveform files remain. This option is mostly used with SEISNET. This command deletes the current S-file. It can only be used if MULPLT is called from EEV. No waveform files are deleted. The files will be merged to one waveform file and the old individual file names removed from the S-file and replaced by the new file name of the merged file. The original waveform files remain. Files to be merged will be shown on a menu. Mostly used with SEISNET. The user MUST have files in working directory. If files are in the data base, they will not be shown on the merge menu. Overlay two channels: It is sometimes practical to be able to overlay 2 or more channels. The channels to be overlaid must follow each other on the screen (sorting might influence that). Move the cursor to the channel name of the lower of the two channels, press & and the channel is marked with a cross. When doing replot, that channel will be plotted in red on top of channel above. Both channels will be autoscaled, but if absolute scaling is used, the real difference in amplitude is seen. Overlay cannot be deselected without leaving MULPLT. This option is particularly useful when comparing real and synthetic seismograms result form moment tensor inversion, see that section later. It is often useful to be able to select part of a waveform file and save it. The Out option makes an output file of the traces AS DISPLAYED ON THE SCREEN with exactly the same channels, and time window in a file with a standard SEISAN waveform name. The output format is by default SEISAN, even if some input files have a different format. A different output format can be selected in MULPLT.DEF, parameter MULPLT WAV OUT FORMAT. The network code in the file name will ALWAYS be the station code if all channels are from the same station. Otherwise the network code has the default name MERGE. Alternatively the parameter MERGE_WAVEFORM can be set in SEISAN.DEF. The data is output exactly as displayed on the last screen, so if filtering or instrument response has been made, the output file will also be filtered or instrument corrected WITH SOME RESTRICTIONS: Not all response, channel or filter combinations are possible. Only 4 pole band pass filters can be used, no rotated channels and none of the magnitude simulated traces like Wood Anderson for Ml. if you want exactly what is seen on the screen for all combinations, use option OutW. 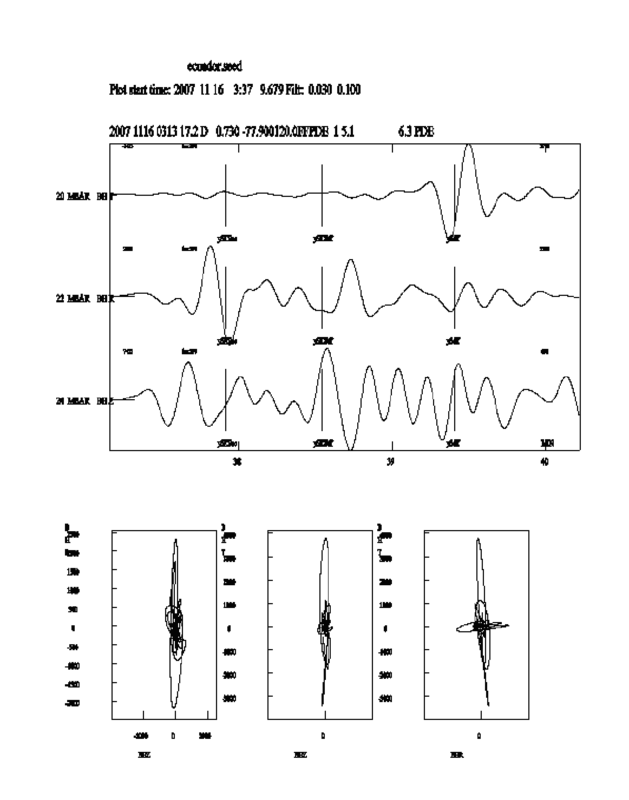 If any filtering or instrument response correction has been done, a note will be inserted in the SEISAN waveform header so the user can see that this is no longer the original data. The note could be e.g. ` Displacement 1.250- 20.0 Hz' indicating that output has been filtered and converted to displacement (nm). Note that numbers have been scaled so only if the SEISAN file is read with standard SEISAN routines, will the numbers be correct. If the output file is converted to ASCII by SEIASC, the number shown must be multiplied with a given scaling factor, see SEISAN binary format description (Appendix B). There is no response information in the header other than the short text. Since the station code is still the same, it is technically possible to correct for the response again using the response information in the CAL directory, however, be aware that this will give wrong results. Option OutW:This option will output the signal exactly as seen on the screen with all the selected filter and response combinations. It also handles rotated channels. The output file is mulplt.wav and it is an Ascci file with real numbers in Helmberger format (readable by SEISAN). To make the file, press OutW and wait for message 'mulplt.wav written' in top right of the screen. For many channels and high sample rate it could take some time since the output is Ascii. If the traces in the window do not start and stop and stop at the ends, then dc levels will be added so all channels in the output file has same start and stop timers. Format description is found in section moment tensor inversion. This option only works if parameter SPECTRAL_OUTPUT has been set in MULPLT.DEF. The output file signal.out contains the last data displayed in the single trace zoom window (in ASCII and real numbers). This option is a another way (see option O(Out) above) of getting an output file that has been filtered or instrument response corrected. The main difference is that this file is only for one trace written in ASCII. Normally all traces are plotted with autoscaling. However, it is sometimes useful to be able to scale the traces with a fixed scale in order to e.g. compare traces or override the autoscale in case a spike distorts the autoscaling. Option *(Scale) will prompt the user for a maximum count to use for the scaling of all traces. Figure 8.7: Using MULPLT for picking phases. The top shows the original trace and the bottom the zoomed part. Note that the amplitude has been associated with the phase E and not the ESg. This means that if the S-phase is deleted, the amplitude will remain. This example shows how running MULPLT from EEV would look. The next example shows how to plot many events in one go, first make a list with DIRF. 0                      ! scale will be different for each plot!! !